We are working with Gallery Oldham to devise creative activities for use with reminiscence boxes. This project is funded by the Barings Foundation and is in partnership with Gallery Oldham. Our final workshops in Oldham for the summer have just finished. Both morning and afternoon sessions were a shared delight. People seemed to be in a larkish mood and expansive enough to take risks. It was a great day in itself, but also a very joyous fashion in which to finish this stage of our project. 'You do have some fascinating subjects to talk about, its livened us all up you being here' Ida. We're running sessions not just for their own sake, but to develop a set of creative activities for use in combination with reminiscence boxes. Such boxes are now a common item in many care venues, but arts activities to go with them and reflect the memories they generate appears to be a new idea. 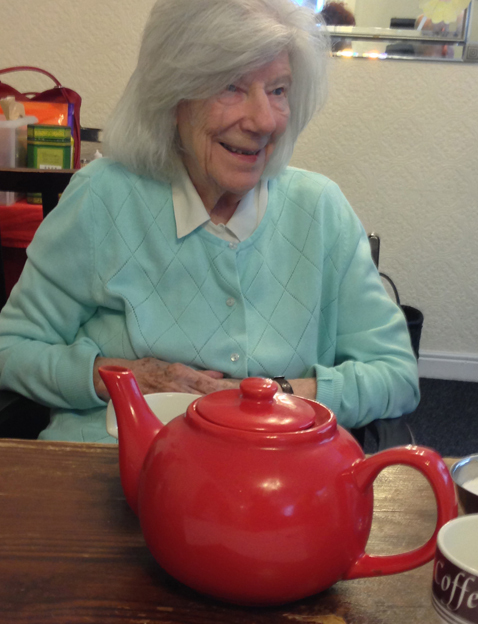 Over the ten years we've worked with older people in care settings, we have tried and tested many ways of making art and poetry with the folks we've encountered. A poem or artwork can intensify the experience that someone's recounted. It's a way of transforming reminiscence, passing it onto others, or keeping it as a reminder of moments that might otherwise be lost. We work in collaboration with the individuals we meet. The pieces are always people's own words, drawings, textiles, sound recordings. Our part is to bring ideas that might spark a poem or artwork. We also select and edit some of the material, which is why we describe it as collaboration – we're lending our skills and the people in the sessions give both their abilities and memories. For a while we've worried how we can put all of this into some simple instructions for rushed care workers. How can you boil down those experiences and complex interactions into a few words? Now we're coming around to the idea that the instructions shouldn't even try to replicate what we do, they're simply about enabling other people to work in the ways they choose, with plenty of room to improvise. Today was a case in point – we went in with the idea of discussing the British Empire and adapted this as we went along, improvising to suit the mood and interest of the groups, including tea-drinking, gramophone records and church ceremonies at Oxford along the way. It's leaving space to improvise that is the key, because in those unplanned spaces is oxygen for the precious spark.